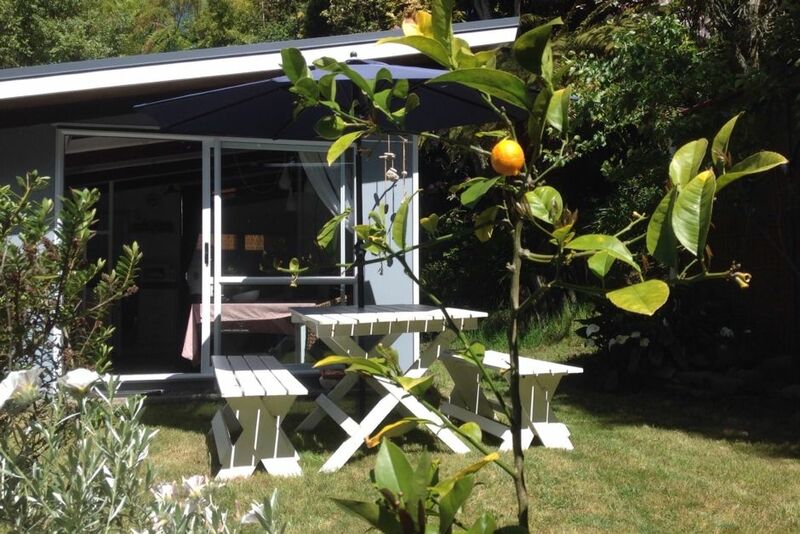 The Blue Cottage Taupo offers a peaceful accommodation for a maximum of four. It's a lovely cottage with the comforts of home - completely self-contained and furnished, with everything supplied to make your holiday perfect. The blue cottage is set in native garden next to a reserve, it's a secluded and peaceful getaway. A piece of paradise away from the chaos of life and ideal for a weekend getaway, romantic honeymoon or a longer break away. Just 5 minutes to the Lake, city centre, shops and restaurants, it's close enough to town to be convenient but far enough away to be relaxing. Cofee and tea is allways provided! Please note, its a one Bedroom Cottage so the Bed and the Sofa Bed are in one and the same Room! Contact details will be provided by Bookabach once you've made a booking request. The studio is attached to the main house the family who lives there lovely and have 2 kids please drive carefully when you come in. 2 carparks in front of the studio. Sets of 4 of everything. Blue Cottage is a super special little place with a charm all of its own. Clean & tidy, private & centrally located! Would definitely stay again. Thank you! Everything was as advertised, owners were very helpful and easy to communicate with. The property was lovely, quiet and very convenient to Taupo. Lovely, lovely setting, no traffic sound, enjoyed all the birds, glad to have Wi-Fi the last week. Glad to have screened windows too. Beautiful little cottage in a peaceful environment. Beautiful little cottage in a peaceful environment. Close to the city centre of Taupo. Very elegant and accommodation. Thanks to Freddy for allowing us to stay in your quaint little doll's house cottage in Taupo. Thanks to Freddy for allowing us to stay in your quaint little doll's house cottage in Taupo. The decor and amenities were perfect for a few days while visiting the great Lake. Appreciate having a little slice of heaven in the middle of the North Island.